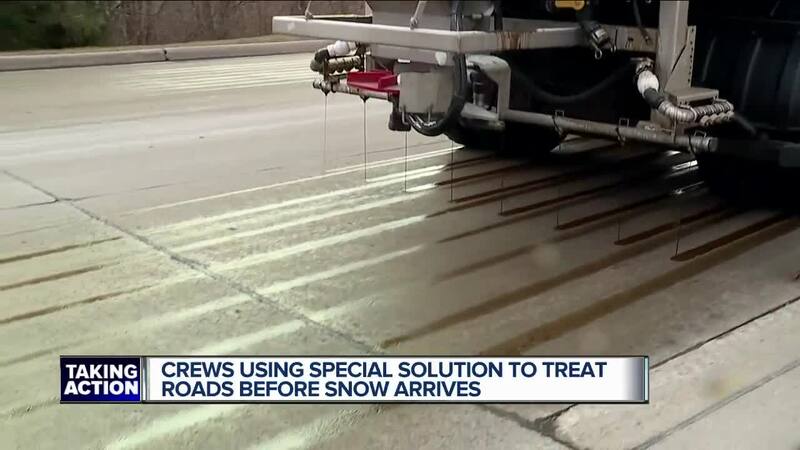 FARMINGTON HILLS, Mich. (WXYZ) — Road crews in Farmington Hills are getting ready for the snow that's expected to fall this weekend around metro Detroit. Not only do the crews use salt, but they use a liquid solution made up of salt brine and beet juice. They've been doing it since 2005. "It lowers the freezing point of the salt water. It's organic. It's not contaminating anything. It doesn't stain. It dilutes itself," says Kevin McCarthy. McCarthy is in charge of road maintenance for Farmington Hills. The beet juice comes from Michigan Farms. "The sugar beet product keeps it sticky and it stays there for a couple days ahead of the storm. It prevents the ice from bonding to the pavement allows us to scrape it off easier," says McCarthy. He says Farmington Hills is among a few cities around metro Detroit using beet juice in the fight against icy roads. The anti-icing solution is made inside the city's Department of Public Works. Not only do crews spray that solution on the roads, they also pre-wet the salt with it too. That way it's already activated as it hits the road. McCarthy says using the beet juice and salt brine has made a big difference in the budget, too. He says the city is using 30 percent less salt every year.